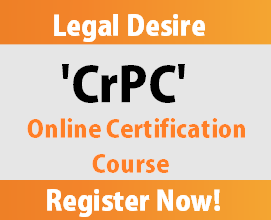 Legal Desire is proud to announce its online Course on ‘CrPC’. A unique and must take online course for Law Students. The theme of this course differentiate from other Online Courses for various Law Students having keen interest in ‘Criminal Law’. Do not forget to mention that you heard about this course through LawLex. There is a ‘field’ in the Registration form of Online Course named ‘Referral Name’, you need to enter LawLex in that field. Alternatively, you can mail us on [email protected] and we will help you in registering for the course.